NEW DELHI—Thirty-one years ago this spring, the world was riveted by a tale of nuclear terrorism called The Fifth Horseman. In this best-selling novel, Libyan leader Muammar Gaddafi threatens to explode a three-megaton nuclear bomb hidden under New York City, unless an autonomous Palestinian state is immediately established. The book was so disturbing that French President Valéry Giscard d’Estaing cancelled the sale of nuclear reactors to Libya, even though they were allegedly intended for peaceful purposes. Today, a real-life twist on The Fifth Horseman is playing out in an unstable, autonomous nation with the world’s second-largest Muslim population, which incubated the global jihadist movement that led to the terrorist attack on New York on September 11, 2001: Pakistan. In this case, rather than France working to deny reactors, China is actively working to supply them. With the remarkable news of Osama bin Laden’s death likely to inflame jihadist anger – a week after Pakistan’s successful test-fire last week of a new, short-range, surface-to-surface ballistic missile that a military press release announced “carries nuclear weapons” – the feeling among leaders here is that the risk of a real-life doomsday scenario is one the global community can no longer ignore. Nuclear weapons have long played a deterrent role here, as they did between the U.S. and the Soviet Union. India, routed by China in 1962, realized it couldn’t defeat The Middle Kingdom in a conventional war, so it launched a nuclear program in 1967 as a deterrent. Pakistan, routed by India in four wars since 1947, realized the same about India, and launched its program in 1972. The threat of mutually assured destruction has kept each nation-state in check since. But Pakistan has gone on a building binge in recent years, growing its arsenal from about 70 weapons in 2008 to 100 or more today. Exact numbers are unknown because Pakistan is not a signatory to treaties that would allow inspection by regulatory agencies. Furthermore, the Pakistani army –which controls the nuclear program – takes a secretive and paranoid approach to its stockpile, deliberately concealing information about the location of its weapons. As the U.S. struck a nuclear agreement with India in 2008 allowing India to trade in nuclear materials, technologies and equipment, China sided with Pakistan, promising Pakistan two more nuclear reactors, allowing Pakistan to build an additional 24 weapons a year. On March 14, just two days after Japan’s earthquake and subsequent Fukushima meltdown, Chinese engineers in Pakistan successfully linked one of the new reactors to a power grid. As a result, Pakistan will soon have the world’s fourth-largest nuclear arsenal. 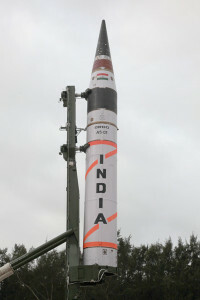 With last week’s test of the new Nasr missile – which establishes, as Defense News put it, that tactical nuclear weapons will be deployed close to the Indian border – the nation with more active terrorists than any other has infinite more opportunities for nuclear devices to fall into the hands of Al Qaeda, the Taliban, Lashkar-e-Taiba, or any other jihadist group. The death of bin Laden only accentuates the danger. First, the U.S. should make clear to Pakistan that if any of these devices land in jihadist hands, or God forbid get used, Washington will hold Islamabad accountable. With Pakistan’s top spy, Inter-Services Intelligence Chief General Ahmad Shuja Pasha, in D.C. last week – reportedly telling the CIA to “get the hell out of Pakistan” – Washington should make clear that it will see no daylight between Pakistani generals and jihadi radicals if safeguards fail. Second, the U.S. should condition all future aid to Pakistan on weapons inspections. The U.S., which has given Pakistan nearly $20 billion in mostly military aid since 2001, should make an offer Pakistan cannot refuse: no inspections, no aid. But in return, the U.S. should pledge to assuage Pakistan’s paranoia about India. Third, the U.S. should quietly persuade India to be more flexible on Kashmir. In 2005, Husain Haqqani, Pakistan’s U.S. Ambassador, wrote that the disputed Kashmir region has “poisoned India-Pakistan relations” but that its settling “could pave the way for normalization between the two countries.” India and Pakistan had a standing agreement in 2007, when Pakistani President Pervez Musharraf directed secret “backchannel” negotiations with India before being ousted. With 2008’s U.S.-India nuclear deal creating a stable relationship, the U.S. should encourage India to support the deal: demarcating the current “line of control” as the border, while allowing Kashmiris to travel and trade across all Kashmir. Hopefully, these steps will be taken before the world’s fourth-largest nuclear power becomes the Fifth Horseman of the apocalypse. This entry was posted in Articles, Middle East, Op-Eds, US and tagged Fifth Horseman, Kashmir, Libya, Muammar Gaddafi, New Delhi, North Korea, Nuclear, Osama bin Laden, Pakistan, US, Valéry Giscard d'Estaing by Stanley A. Weiss. Bookmark the permalink.